Mary Baker Eddy wrote something about a net we must get through. I felt as if the net had been thrown, for sure, and I was supposed to ‘get through it’; rather than listen to the Universe shouting at me,“get out of that religion! Save yourself while you still can!” So, I marched on, trying to find another Teacher. The First Church of Christ, Scientist and Miscellany by Mary Baker Eddy, p. 241. I went to our annual trek to a Christian Science camp that summer; we had gone for two decades or more throughout my life; and I met a Teacher there. I went through Class with her the next year. On the first day of Class Instruction, my Teacher said to all of us in what was probably the second sentence out of her mouth on day one: “I have never had a class full of so many people having such animal magnetism to get through in order to be here.” I knew that I had jumped through hoops and all sorts of things in order to be there. But, it turned out that everyone else had too. Of course, all those road blocks and things I had to hurdle to get there, was probably The Universe telling me, “don’t do it!” And in Christian Science, I was taught, “kiss those crosses! Then you’ll get the crown!” I was just getting started with too many crosses to come. A few years after Class Instruction, I became a bona-fide Journal-isted Christian Science Practitioner. Then, I set my sights on becoming a Christian Science Teacher. The way things work in Christian Science, everything is completely secret. The only people who knew I had gone to Class Instruction were my step mom, my dad, and my husband. I didn’t even tell my kids. (Though they were very young anyway, one was out of diapers by then and the other was still in diapers.) Then, when I was working towards becoming a Journal-listed Practitioner, I didn’t tell anyone. I applied, and it took them 18 months to accept me. It was the weirdest thing. I think they lost my application, because when I hadn’t heard from them in 12 months and finally called them up to say, “how is my application proceeding?” They said, “oh, for getting re-listed in the Journal?” I said, “no, I was never listed yet.” That surprised them, then they proceeded on my application. It took another few months after that for my listing to appear. Another hoop for me to jump through? Another cross to kiss? Another message from ‘The Universe’ saying: “don’t do it!”? Who knows. Meanwhile, I was seriously committed to my branch church. A Journal-listed Christian Science Practitioner can have no other job, no other source of income, and I had worked hard not to have any other employment (I had quit a few home-based businesses that did bring in reliable income). I never made any money as a Practitioner. In fact, I lost money. I bought a computer so I could have Concord (a computer program that is a concordance to The Bible, and other books by Mary Baker Eddy, and the Christian Science Hymnal) installed on it. Concord is expensive. Computers are expensive. I paid money to fly every year for my Association, hotels, meals, and extra days in the hotel because unlike most Teachers who have Association in one day and students can fly in and out on the same day, my Teacher had it span three whole days. It starts Friday night and ends Sunday afternoon. I bought at least two new sets of very expensive Lesson Books (one was the new vivella set that I really loved), and I subscribed to ALL of the periodicals, and the full text Quarterly, and I had subscriptions to CSMonitor.com, eBibleLesson.com, and myBibleLesson.com. Things add up. I believe that the membership’s wallets are one of the reasons the church stays in business. Did you know that each Board of Directors Member makes $200,000/year now? They come up with endless things for members to spend money on, and as a Practitioner, I felt obligated to buy everything. My husband’s salary paid for everything. I sure as hell didn’t make any money from people who would call me at all hours and never pay the bill. I had three or four patients who did reliably pay their bills to me. Other than that, it was like pulling teeth, and I was supposed to be gracious about their non-payment. I had so many people badger me about why they shouldn’t need to pay someone for prayer. And I didn’t feel at liberty to enlighten them and say, “I’m not allowed to have any other job, don’t you want me to be able to give food to my family and have a roof over my head? Don’t you value the work I do for you?” I did witness what I thought were healings at the time. I don’t feel like I had any serious cases come to me. I had a bronchitis case, and a first degree burn case, and I had some other dog cases. I had one person call me a lot who clearly had mental issues, but she wasn’t calling me as a Practitioner. She called me to help her because I was a church member who was home all the time and we lived near each other. She wanted me to drive her to a Christian Science nursing home that takes care of mental patients, several states away. I would have done it, too, and done her laundry and cleaned her house and taken care of her pets, but she was so nasty and refused to pay me anything, so even though I would stand in her bedroom, I was paying as little mental attention to her as possible. She did have another Practitioner working for her also, and would jerk me around telling me to pray for her, stop praying for her, no pray again, STOP praying…it was exhausting so I just didn’t pray for her any more anyway, and just wanted to help her pack her clothes so we could take her to the mental wing at a Christian Science Sanatorium. She got quite upset at me when I stopped letting her jerk me around anymore, and she finally dismissed me. I didn’t need to be abused by church members who weren’t even paying me. I had another patient who called me every 20 minutes around the clock, with a four hour window in the middle of the night when she wouldn’t call. She would never tell me her last name or where she lived. I had a baby boy who also didn’t sleep through the night, and this woman was abusing me and refusing to let me even bill her. I finally dismissed her and blocked her calls. It took me a long time to stop feeling guilty for blocking her calls, but it was abuse, and I couldn’t take it and be a good mom. So, I chose to be a good mom. One of my cases was maybe a sprained ankle, and I had cases for a cold or other small things. I never got cases where someone was “on the verge of dying and needed a radical healing right now!” I did have one elderly man come to me for prayer, and I think he has a strong fighting spirit now too. It’s been a number of years since I was a praying Journal listed practitioner, but he is now bed-ridden. I don’t think he ever had a healing while I worked for him. But his wife paid me dutifully, and she and I had worked together with their insurance company to get her reimbursed for paying me. That was interesting. The insurance policy covered it, but no one knew how to mark it in a code. Christian Science Practitioners don’t have billing codes. It took maybe 18 months of back and forth with the insurance company to get her reimbursed for a bill that was less than $200. I had no idea there were Christian Science nursing homes with mental wings! Where was this at? Growing up in a Christian Science home with many family members with mental health issues, I never knew one existed! I seriously do NOT recommend them. They get everything completely backwards. I know someone who “had a healing” of mental illness. And he wrote a huge paper about CS sanatoriums where he stayed that were supposedly set up to help mental patients. He went on & on about all the things they did completely wrong. For instance, taking away clocks. Walking in & ignoring people as if they aren’t there, when they want to communicate & have help sorting out their thinking & conversation will HELP them. This person had also stayed at non-CS facilities & saw the complete difference. The way they SHOULD be. (Now, not all of the non-CS places are alike; some are great & some are completely awful!!!!) ….. But it was interesting to me to read just a few of the examples my acquaintance had written about, from viewing both kinds of places. & seeing how exactly wrong the CS facilities are. You can view a list of all facilities here. I don’t know that any will specifically SAY “we take mental patients,” but you can start by calling your local place & see if they know of a place that takes them. But, again, I would seriously NOT recommend a stay in any CS facility. All they can do is bathe you, help you get dressed, make your bed, and feed you ice cream. Seriously. Oh, yeah, and give you 24 hour access to CS tapes over a speaker. Sometimes loud enough to drown out moaning from down the hallway. About your long experience in CS. Please, everyone who has come to this blog – please read this book – it’s readily available on Amazon (dot) com. “God’s Perfect Child” by Caroline Fraser. It’s a well-documented history of the Christian Science church. It’s got court documents, reputable news sources, city records. It’s an amazing book. It even gives a fascinating history of the Publishing Society and the Christian Science Monitor. Thank you, Patrick! I love your music! I found it on Apple Music and it’s the perfect jazz piano music I love. My bio mom used to take me to smokey Jazz bars in the 70s. I once told that to my husband – we were out at a jazz bar. I said, “this reminds me of my childhood.” He told me I probably shouldn’t admit that sitting in a smoke-filled jazz bar reminded me of my childhood, hahaha! Patrick – what brings you to our site? Are you also an Ex CS? Or are you just curious about the CS experience? Or…? Thank you for being here, reading about it, and commenting. It means a lot to me when people comment. Crystal, thank you so much for writing this – for sharing your experiences here in this and other posts. I am from a family in which Christian Science was practiced sternly and consistently. My siblings and I are lucky to have survived to adulthood. We have watched our elders, a grandparent and a father in particular, die from prolonged, painful, and easily treatable illnesses. We are currently facing the prospect of losing our mother to an undiagnosed illness (we don’t know the symptoms and know better than to inquire) while she is on another continent. She does not want visitors or even phone calls. It is a searingly painful, familiar, and (for me) sadly unsurprising situation. My mother, her mother, and her mother’s mother were (are still, in mom’s case) Christian Science Practitioners. Learning more about the experience, through reading your post, gives my heart ease. There is nothing I want more at this moment than to be able to get to know my mother more deeply while she is still alive. Your post gives a bigger window into the life of a CSP and helps me better understand some of the (consistent) problems that practitioners face – especially with abusive and manipulative clients – which I’ve only heard oblique references to in the past. My greatest source of strength in the moment is that I have been emotionally and psychologically “in training” for this painful era since my father passed away due to insistence on “radical reliance” on CS, a decade ago. I love my mother and I will miss her dearly when she is gone. When the time comes, we will bury the plague that has been the influence of Christian Science in our family along with her. We will no longer live in steady fear of the next time that we will be subjected to the special torture of seeing a loved one experience severe suffering and untimely death due to their faith. That’s a lot about me and my situation. I wanted to share some details to help anyone who is reading this and experiencing something similar know that they are not alone. I also hope that these details will help you understand why reading about your experience has been so moving and meaningful to me. Every two or three years now, for about 15 years, I’ve searched the internet for an online community of ex-Christian Scientists. Today was the first time I found any resource like this – a gathering place for people who understand this weird and often painful journey – where we can share stories and find comfort in our shared challenges and successes as survivors. 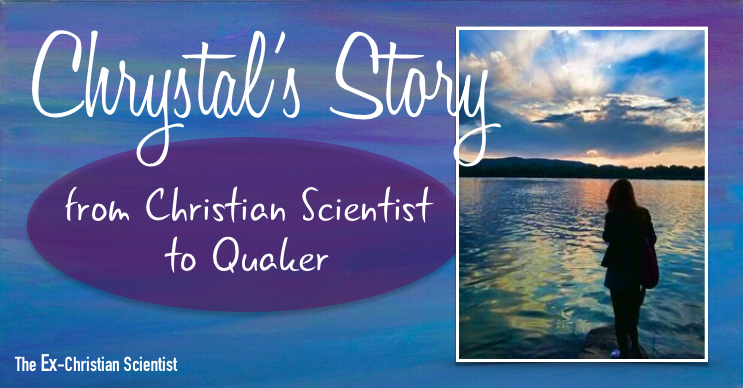 Reading the blog posts and links I’m finding here, by you, Elizabeth, Kat, etc., is beginning to satisfy my now well-aged longing for community and shared support with fellow ex-Christian Scientists. I am profoundly grateful to you and all of the editors and contributors here. I look forward to being a part of the conversation in the years ahead. I cannot get out of cs. I am trapped, dad died mom died this past thanksgiving fear of body, fear of doctors, I would not wish this on [anyone] the way I am conflicted I cannot continue like this. I am so sorry to hear about the deaths of your parents. It takes a lot of persistence to get rid of the brainwashing we grew up with in christian science. I hope you will consider joining the Ex Christian Science Facebook page. Being in that group, reading the books (recommended here on this blog and also in the Facebook group) and talking with a therapist and later, a psychiatrist, has helped me so much to move on to a healthy mental place in my life. Please get help. Please consider joining the Ex christian science Facebook page. I am so sorry to hear about the struggles your mom is going through. And to be a continent away. That’s another layer of heartbreak. And to not be able to ask, “what’s going on” is another layer again. I am so sorry you are going through this pain. I am so glad you found the website. 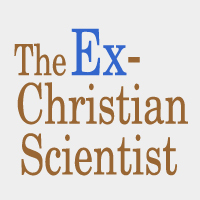 I would like to recommend you also join the Ex christian science facebook group – https://www.facebook.com/groups/exchristianscientists/ – they have helped me process things in ways that no one else would have been able to. I am glad my story resonated with you and helped you feel less alone. That’s why I wrote my story – to help others not feel so alone. I am so glad my story has done the job I wanted it to do. I stumbled across this website tonight. I was raised a CS. I can’t even begin to tell you the harm it has done to me and my life. The ridicule of others as I was set apart as a young child who had to every year take an exemption form to school because I didn’t get vaccinated. As others have stated, growing up not allowed to talk about any emotions other than joy, love, and gratitude. The total dismissal of who I was and how I thought. And then there is the guilt. “ Your thinking governs your experience.” If you don’t think correctly, it is your fault that bad things happen to you, you get sick, people don’t like you, you don’t get a certain job, or house. You are not a real person. The idea that you have to be perfect all the time-that perfection is the goal. Then there is the secrecy. It was all extreme emotional abuse. The physical abuse of not treating illness, I too don’t know how my brothers and I survived childhood. I had a broken wrist when I was five. It was 10days and a useless, Black and blue painful arm that led a relative to take me for medical care and set the bone. Temperatures of 106 for days, mumps, measles, infections, migraines, untreated injuries. My two brothers largely don’t seek medical care. We are all in our 60’s. They don’t believe in CS or metaphysical healing, they have just been raised that all doctors are quacks and medical tests, hospitals etc. are worthless. I went in an opposite direction, my poor kids were seen by doctors for every little thing. My husband stood by my side and even attended CS services with me when we were first married. But his love and example finally showed me a way out. I had to learn that God heals but not because of something I think or do. In my 30’s after a nervous breakdown of depression and anxiety, I began to experience through therapy, the “truth” about who I really was. In my 40’s I was ordained as a United Methodist pastor. My relationship with my mother, who I believe was mentally ill and CS fit perfectly into her naracism and other issues, has been extremely tense for decades. She currently is 90 years old and has abruptly stopped medications and medical care for life threatening issues. Her extreme need to be in control is and has been a quality of life issue. She truly believes that she will control her death. If she prays right, she will just float off this world in her sleep. Death is not real.As she aged and ran into significant pain and failures of her body she would seek medical care. But of course she lied to her caregivers about her physical problems, would not take medication as directed, and then when doctors refused to see her would go back to CS. My brothers and I agreed that it is her choice of how to live her remaining years. I have chosen after over 60 years to no longer be her medical or regular power of attorney or be manipulated to be her caregiver. I turned all those responsibilities over to my brother. Yes, I’m angry about CS. I lost my mother to this practice. I lost my father, as he would not protect me and go against my mothers beliefs. My children and grandchildren have missed out on having a grandparents unconditional love. However, we are all compassionate, caring, spiritual persons that believe in a God of grace. I wish I could say I have recovered from all this abuse but I have to intentionally work on my mental health and identity issues every day. I have never been able to be a perfect, loving, daughter according to my mother. I have 4 wonderful children and 3 grandchildren so far. We are a very close but very imperfect family. I have been very successful in my career and life. But never being able to live up to my mothers expectations and need to control everything around her as taken it’s toll. How interesting I should happen across this blog. I was seriously considering going to a Christian Science church to find out more and get a feeling of what its like. After reading this, Im not sure now. I was raised a Roman Catholic but have serious questions and doubts about this religion too. I was looking on the internet for courses in New Thought Practices and that’s how I found Christian Science. I will keep on looking, perhaps Try Unity Church but not sure is that is the same thing.